The Escape is one of the few small SUVs that still looks like a truck. Its square shape provides excellent all-around visibility and interior space. The Escape comes with a 4-cylinder or V6 engine, in a front- or all-wheel drive configuration. It drives comfortably and is very practical inside, which is why it was the best selling small SUV for many years. The interior is not luxurious but simple and functional. Seats are comfortable and tall driving position offers commanding view of the road. The rear liftgate glass opens separately, making grocery loading easy. Rear seats fold flat providing plenty of cargo space. The reliability is not flawless, but a used Ford Escape is priced a few thousand dollars cheaper than the same age Honda CR-V or Toyota RAV4. Should used car buyers take advantage of the lower price? What are the common problems and how expensive are the repairs? What model is better, 4-cylinder or V6? We've done our research and will try answering these questions in the review. 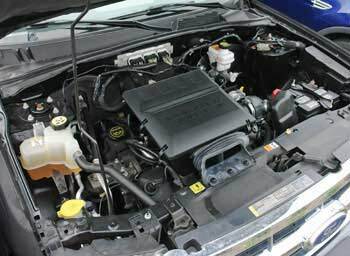 Ford Escape V6 3.0L engine. Mechanical: The Escape comes with a 2.3L or from 2009, 2.5L 4-cylinder engine or a 3.0L V6. Transmission choices include a 4-speed or from 2009, 6-speed automatic. A very rare 5-speed manual transmission is only available on 4-cylinder front-wheel drive models. 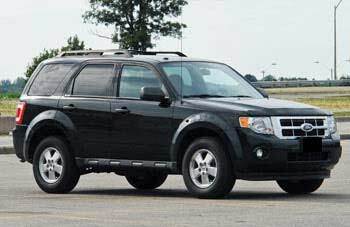 Ford Escape was developed in association with Mazda and runs on a front-wheel drive platform with optional all-wheel drive. It has electric power steering and independent suspension at all 4 wheels, with struts in the front and coil springs in the back. In all non-hybrid models, rear brakes are drums. 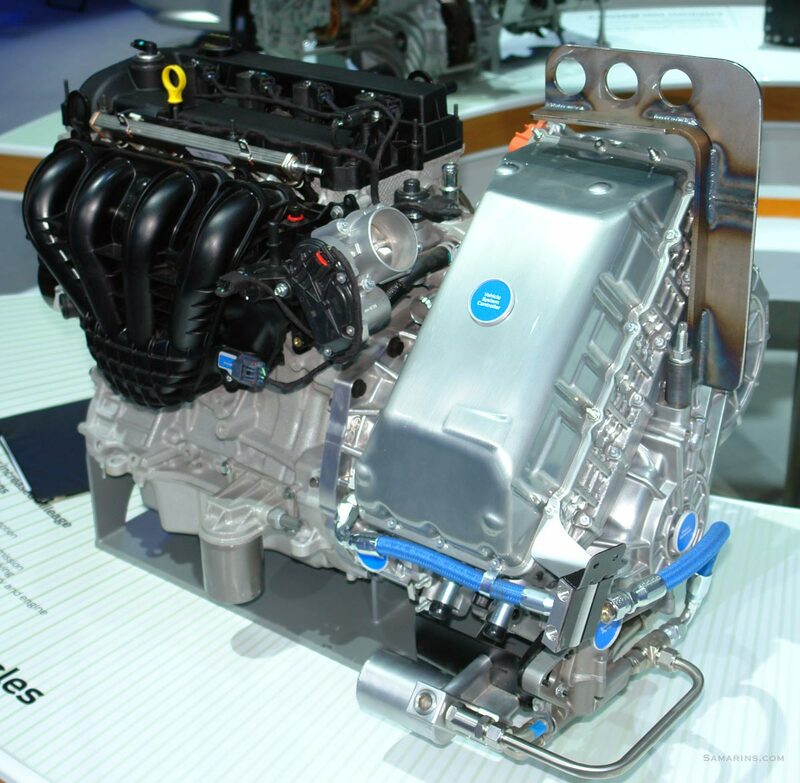 Engines: Both, the 2.3L and 2.5L inline-4 are Mazda-sourced engines. Both are proven very durable and mostly trouble-free. The 3.0L Ford V6 is also mechanically-solid. There were some issues with VCT solenoids in 2009 V6 models, but other than that, it's a good engine. All three Escape engines have a timing chain, there is no timing belt. Handling and ride: The Escape drives very comfortably. Visibility is excellent and even the 4-cylinder engine feels quite peppy. The only minus is a fair amount of road and engine noise. The Escape's 4WD system is helpful on snowy roads, but it's not something you can use on an off-road trail. Fuel Economy: The 2009-2011 front-wheel drive Escape Hybrid is rated at 34/31 MPG, which makes it the most fuel-efficient SUV among 2008-2011 models. However, they are rare to find; only 4 percent of all Escapes on the used car market are hybrids. On the other hand, about one third of all Escapes are front-wheel drive 4-cylinder models, that are also very good on gas. On a long highway trip, the FWD 4-cylinder Ford Escape can get up to 430 miles (692 km) to a tank. Ford Escape Hybrid: The Escape hybrid uses a hybrid powertrain technology similar to that of Toyota Prius. It combines the power of the 4-cylinder engine and an electric motor. The hybrid battery is built under the cargo compartment floor. Despite the complex hybrid technology, Consumer Reports rates the Escape Hybrid better for reliability than a regular Escape. The 2010 Escape Hybrid got the best score for customer satisfaction among small SUVs based on Consumer Reports surveys. Check this page about the 2008 Ford Escape Hybrid with over 500K miles (!) and the issues that happened over the years. Safety: Antilock brakes and AdvanceTrac stability control are standard on non-hybrid models. Side and side curtain airbags are standard. See NHTSA crash test results in the table. For 2011, the NHTSA brought more stringent tests, where the 2011 and 2012 Ford Escape got three stars overall with three stars for the front and side crash protection and three stars for rollover resistance. Pros: Optimum size, truck-like styling, excellent visibility, practical interior, plenty of cargo space, liftgate glass opens separately, available SYNC, fuel economy for FWD 4-cylinder models, powerful optional V6, affordable price. Cons: Does not hold value well, interior materials could be better, average reliability, road noise, stains on the seat fabric are hard to clean. Overall: The main downside of the Escape is its predicted used car reliability that is rated only as high as "Average" by Consumer Reports. On the other hand, used Ford Escape models are priced much cheaper than more reliable competitors such as Toyota Highlander, Toyota RAV4, Honda CR-V or Honda Pilot. 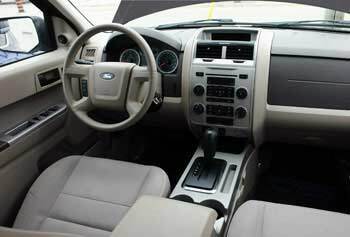 The Escape electrical power steering problems were a major concern, but Ford issued the recall in May 2014 to address the issue. Transmission issues are expensive to repair. If you are buying a pre-owned Ford Escape, you may want to pay particular attention to the way the transmission shifts during the test drive. FWD or AWD? 4 cylinder or V6? Unless you really need an all-wheel drive, we recommend the 2010-2011 front-wheel drive 4-cylinder models, as they are much better on gas. The V6 is not bad, but it's a good idea to avoid 2009 V6 Escapes, as there were some expensive flaws with the VCT solenoids that were resolved in later models. Another disadvantage of the V6 is that sometimes one of the ignition coils could fail and it could be quite expensive to replace coils and spark plugs on the rear cylinder bank in a V6. The 4-cylinder engine is cheaper to maintain and requires less repairs. The Escape's AWD system is simple and mostly trouble-free. 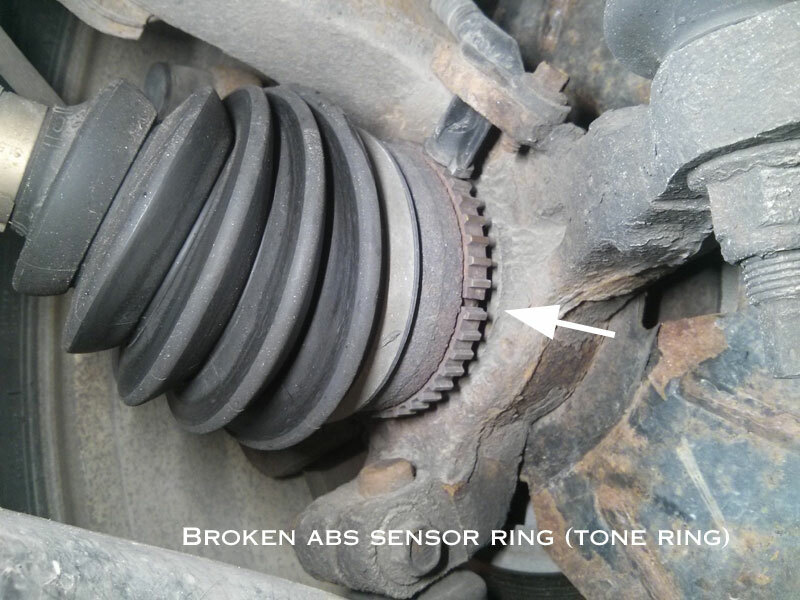 Ford Escape common problems: A front ABS sensor ring (tone ring) may break causing the ABS light to come on and the traction control acting erratically. See the photo. The tone ring replacement is not very expensive ($15-25 part plus $80-$180 labor). Rust damage to the rear quarter panels and tailgate is often mentioned by the owners in the Rust Belt. Front sway bar links go bad often resulting in a knocking noise from the front end when driving slowly over small bumps. Again, it's an easy and inexpensive repair: $150-$230 (parts and labor). This thread describes the DIY repair. Corrosion at the liftgate release switch can cause the rear glass or the liftgate not to open from the outside. The release switch is the button located under the liftgate chrome bezel that you press to open the liftgate or the rear glass. The switch is also inexpensive ($25 at RockAuto) and is easy to replace. If your A/C blower motor works only in 3-rd and 4-th speed, it's very likely that the blower motor resistor has failed. The part is not expensive. The blower motor resistor is located on top of the HVAC duct behind the glove box and is easy to replace. Many owners mention the leaking left axle shaft seal in the 2009-2011 Escapes. Symptoms include dropped transmission fluid level and fluid leak on the driveway, in the left front area. The repair involves replacing the seal, inner CV-joint housing and possible axle bushing. The repair kit is available at Ford dealers. According to many owners, the repair is covered by the powertrain warranty. This repair might be expensive ($350-$620) if not covered by warranty. Throttle body issues are not uncommon too, but according to many sources, Ford has extended the throttle body warranty coverage to 10 years or 150,000 miles. Read more at the NHTSA website. The Check Engine light with the code p0171 could be caused by a contaminated MAF sensor. Cleaning the sensor usually helps. Blend door actuators could make a buzzing noise in the 2008-2009 Ford Escape hybrid. Failed blend door actuators need to be replaced. Maintenance tips: The owner's manual for the 2008-2012 Escape recommends using synthetic blend or full synthetic 5W-20 oil. Ask your mechanic to check your transmission fluid at every oil change, as transmission fluid leaks are not uncommon. If the transmission fluid level is low, look for leaks. Rust proofing can help protect the body from corrosion in Rust Belt states. Rear quarter panels and the liftgate are especially prone to rust. Ford Owners - check the maintenance schedule or download an electronic copy of the owner's manual.